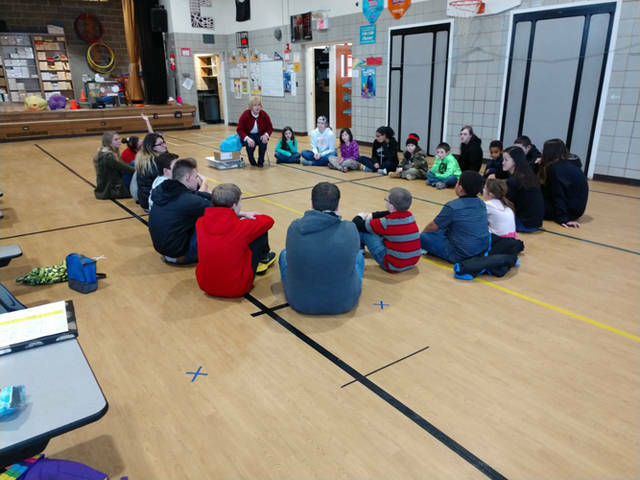 A representative from Shelby County Soil and Water Conservation District presented to a Big Brothers Big Sisters Big Buddies after-school mentoring group at Sidney City School’s Emerson Elementary during the 2017-18 school year. The Big Buddies program is seeking volunteers for the 2018-19 school year. DARKE COUNTY – Big Brothers Big Sisters of Shelby & Darke County announced its 19th year of programming for its after-school Big Buddies mentorship program. Fun and energetic high school students are needed for the 2018-19 school year to mentor local elementary students. This is an opportunity for high school students to give back to their community, receive service hours toward graduation requirements, be eligible for scholarships, add the experience to employment applications and make a difference in the life of a child. Big Buddies is a nine-month commitment in which high school freshmen, sophomores, juniors and seniors volunteer two times per month to mentor elementary students. During these meetings, high school students, under the supervision of Big Brothers Big Sisters staff, work with one or two children on educational and recreational activities. This year’s curriculum is titled “Mindfulness: Healthy Minds, Healthy Bodies” and will focus on brain development, social and emotional growth, nutrition and exercise. By partnering with parents, guardians, volunteers and others in the community, BBBS is held accountable for each child in its program achieving higher aspirations, greater confidence, better relationships, avoidance of risky behaviors and educational success. The Big Buddies program has proven beneficial not only for the “Littles” but for high school volunteers as well. Individuals who would like to become a Big Buddy and make a difference in the life of a child should contact Big Brothers Big Sisters of Shelby & Darke County at 937-492-7611, 937-547-9622 or go to www.bigbrobigsis-shelbydarke.org for more information. Big Brothers Big Sisters is a non-profit, United Way member agency.